1. Build a dam from Seatoun to the east side of the harbour. 2. Install pumps powered by windmills and pump all the water out. Note that the windmills should be old fashioned looking ones to attract tourists. 3. 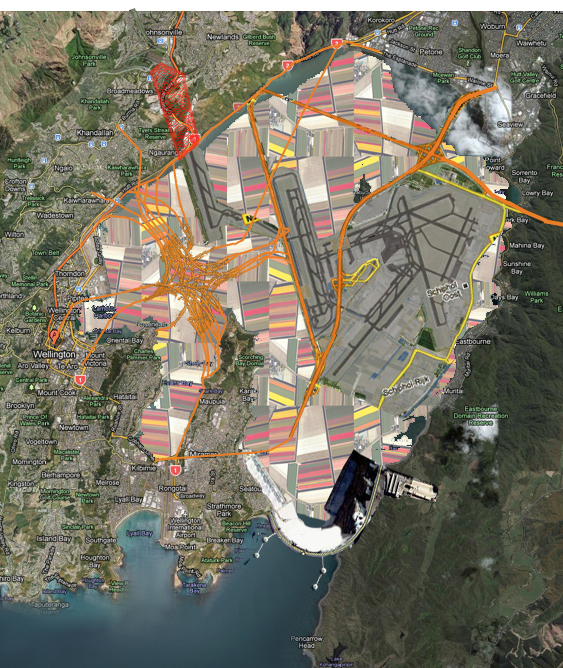 Build a honking big airport on the harbour floor. Schiphol has 6 runways over a vast area, so I propose 7 runways to give us something to boast about. 4. Plant the rest of the harbour floor in tulips. 5. Make Greenies happy by running light rail out to the new airport. 6. Make everyone else happy by joining the airport up to the motorway using a giant 4 level stacked junction with 5 lanes in every direction. 7. Sit back and smoke a lot of drugs. This plan, which I am sure you will all applaud, has the added advantage of removing the need to re-pile the Outer T.
Sorry Minimus! But if you’re keen, I’d love a graphic with a dam across the heads, Schiphol airport overlaying the harbour (which might be a real squeeze since Schiphol must be the best part of 8km across), some windmills, and a Los Angeles style motorway connecting Eastbourne and Taranaki St. If possible, one of the longer runways should be oriented to face Johnsonville so that we’d have an excuse to dig the world’s first aircraft tunnel under the suburb. Tulips and removal of a diving board would be handy too if you’re able to work in a large scale. I think all I have not accomplished was the request to do something about a diving board. New Wellington (Eastbourne) Airport, Harbour dam, tulip fields, LA style motorway interchange and world’s first runway tunnel. Not my best illustrating work, but I think it captures how awesome the idea would be. That’s absolutely brilliant! I love the way the dam is a cool bit of Hooveresque deco rather than an Upper Hutt style stopbank. And I’m sure the world’s most complex motorway junction will draw more tourists than all that hobbity stuff they come for at the moment. I’d suggest that once this modest phase 1 is complete then we look at turning Somes Island in to something resembling Mont Saint-Michel, but with a moat. And since the current Cook Strait ferry terminal will be a tulip field, replace it with some sort of high speed hovercraft service to the South Island. The hovercraft can start from Queens Wharf, run up Ngauranga Gorge, then hit the Strait at Porirua with a down hill run up. Everyone gets 15 minutes of fame. I was saving my 15 minutes for a meaningless fling with a Hollywood bimbo that would see us in the tabloids when I dumped her. But my own post in Fish is a pretty good substitute. Thanks! wait…you want to pump out the harbour, then add a moat around somes island (which had to partially flattened for the airport)? It’s like you’re not even trying to have this plan make sense. and, for good measure, that was our 300th post, with 4,256 comments (now 4,257) over the 3 years – thank you for joining up and making such a stunningly accurate piece of urban planning. Yep, there’s 7 runways, and one pointing to Johnsonvile, and tulips, and a honking great airport, and even an intersection with what looks like at least 4 levels and 5 lanes coming out of everywhere. I clearly should spend more of my time fooling around productively. Perhaps you could offer your services to the NZTA, as I believe they’re trying t do something similar to the Basin Reserve (but possibly with less tulips). I’m currently working on a roading project and had to wipe tears of laughter from my eyes when I looked at this. Thanks for the Friday p.m light relief! Your ideas do you credit. I think these are so much more superior to the idea of filling in Lyall Bay for the Airport Extension which was put forward by an reputable engineering company in the 1970’s. It is also something worth considering after future earthquakes hit Wellington as there will be quite a bit of fill material from buildings, landslides, Tsunami detritis etc to deal with. Having a superior plan like this or your previous musings would mean that you would know where to dump your fill material. Also have you thought of an aquaculture/tide generation venture to fit in with your plans. You could have fish farms instead of grass fields around the airport. With a flush of tides generating energy. Be great for tourism to see the fish farms and eat the produce with the positive benefit of energy. This isn’t to scale, so it’s hard to take seriously, but I Cr Morrison would love it; Northbound from Maupuia resembles his mystery delivery. I do like the idea of a potentially split level runway, too. It’ll be noisy in the tunnel, though, so you’d need a 200m high sound barrier along the border of Khandallah… hell put it all the way round. the airport is in fact too scale of the city. Other elements are improvised.